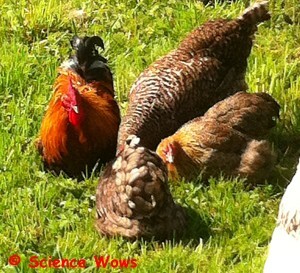 As hen keepers we have debated whether we should keep a rooster in the flock or not. Truth be told, they have usually ended up in there by proxy and we just tend to let them stay. We do try to keep it at just one rooster at a time though…. there is only so much crowing one neighbourhood can take! So for the last year or two “Lord Farquaad” has ruled the roost that is our back garden. He is a very handsome Pekin bantam, small and round, charming characteristics of his breed. What he lacks in stature he makes up for in ego…. hence the name. Lord Farquaad – small in stature and big in ego! why does the rooster crows? Ultimately they crow to mark their territory! The sound levels are a throw back to the habitat of their wild ancestors… you need to have volume to be heard in the jungle! If you are like me, you may have just gone along with the assumption that light is the overriding stimulus for the roosters predawn fanfare. However, recent studies in Japan have shown that this is not the dominant factor! By varying the amount of light hours roosters were exposed to a different picture emerged. One set of roosters were exposed to 12 hours of light and 12 hours of darkness for 14 days. These roosters exhibited anticipatory predawn crowing two hours before dawn. Another group were kept in constant dim light for 14 days. This group settled into a 23.8 hour day cycle, crowing daily at almost the same time to declare to dawn regardless of the lack of light. This finding reveals that roosters actually have an internal clock in place. They will crow at a regular time each day due to their own circadian rhythm. Light and sound are contributing factors to their morning crowing, but the process goes on even in the absence of these stimuli. 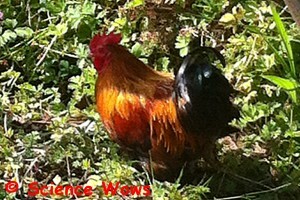 Roosters don’t just crow to mark the start of the day, they can often be heard crowing at various other times. The frequency of these calls depends on local threats, the flock status and the breed and temperament of the bird in question. Of course they don’t just crow either, they can cluck too, just like their female counterparts. It never ceases to make me smile when Lord Farquaad struts around the food I have just put out, making a series of clucking noises that declare the provisions. To me his declarations appears to say “ladies, ladies come hither and feast on the bounty I have provided for you!” I mean really, you would think he cooked it all himself! Perhaps you have another translation to add? If you have comments or questions I’d love to hear from you!